The upcoming Paris Motor Show is one of the main attractions of the year and it's where many car makers will present their latest creations. 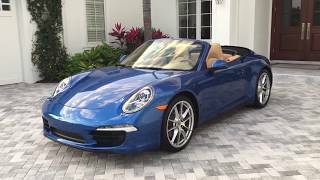 Amongst the numerous companies showcasing their upcoming models can be found the Porsche and their brand new Porsche 911 Carrera 4 Cabriolet 2013. The new 911 Carrera will be available in four variants, the Carrera 4 and 4 S, both of which will be offered either as a coupe or as a convertible. The Carrera 4 will be motivated by a 350 horsepower power plant able to push the Coupe from 0 to 100 km/h in 4.5 seconds and the Cabriolet in 4.7 seconds. Top speed is rated at 285 and 282 km/h for the Coupe and Cabriolet respectively, and if mated with the optional Porsche Doppenlupplung (PDK) gearbox, fuel consumption is rated at 8.6 liters /100 km with 203 CO2 g/km emissions. The Cabriolet on the other hand is rated at 8.7 liters / 100 km and 20g g of CO2 / km. As a standard the new 911 Carrera comes with a 7-speed manual gearbox. The Carrera 4 S on the other hand has been equipped with a 3.8 liter boxer engine that develops 400 horsepower and can go from 0 to 100 km/h in 4.1 seconds or 4.3 seconds for the Coupe and the Cabriolet respectively. Tops speed is either 299 or 296 km/h depending on the variant and fuel consumption is 9.1 liters / km or 9.2 liters. Porsche's upcoming Carrera 4 will hit the market featuring the latest version of the active all-wheel drive system also known as the Porsche Traction Management (or PTM) which promises to deliver great traction on a wide variety of weather conditions and road surfaces. Same as its rear-wheel-drive counterpart, the Carrera 4 / 4 S will feature a lightweight body design, the same suspension, engines and gearboxes, but due to the all-wheel-drive nature of the car, the new model comes with a slightly different rear-wheel section, where the wheel housings have been extended outwards by 22 mm and the rear tires are also 10 mm wider. New features available in the 2013 model includes an all-wheel drive indicator, a sliding glass sunroof, the Porsche Active Safe system, the extended Sport Chrono Pack and Adaptive Cruise Control just to name a few. The new Porsche 911 Carrera 4 2013 will be available for purchase by the end of the year, with prices varying from 97,557 Euros and 110,290 Euros for the Carrera 4 Coupe and Cabriolet respectively. The Carrera 4 S on the other hand will have a price tag of 112,313 for the Coupe and 125,046 for the convertible. The competition remains the same as before and includes the Audi R8 Spyder or the BMW 6- Series Convertible.